Weather has been nice and warm here in Kiakyushu. I have been using a pair of long underpants during winter time, but it seems that it’s time to say “bye bye” to them. I am going to miss them until we meet again next winter. 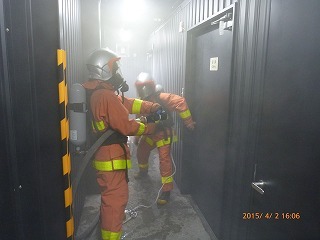 I would like to introduce one scene from Firefighting Training of STCW course. 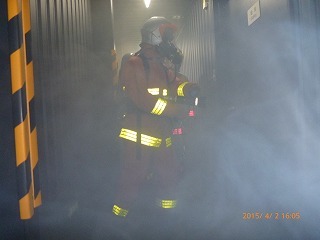 The equipment been carried on delegate’s shoulder is self-contained breathing apparatus. This item is widely used when the firefighter has to work in the space where very low in oxygen level. Delegates looked great when they were challenging the training with earnest eyes. I can create photo collection using their photos. Let me share the photos with you. Entering the cabin after confirming the safety. Search if there is any fire or survivor. Let me introduce some of the comments by delegates. I am very happy to hear that we could help to raise all of your safety awareness. Nobody can tell when we encounter an emergency situation. We recommend you to recall acquired techniques regularlly so that you’ll always be ready to use them.